There is nothing better on a cold winter's day than a nice stick-to-your-ribs stew. I found this stew recipe and it looked so creamy and good. I also noticed that it had a slight sweet and sour spin to it and thought it would be something different. We both gave this 4 out of 5 stars. This will definitely go on the list for remaking. This recipe makes 8 servings. 1. In a nonstick dutch oven,, cook pork in oil over medium heat until no longer pink; remove and keep warm. 2. In the same pan, saute onion until crisp-tender. Add garlic; cook 1 minute longer. Add the broth, vegetables, vinegar, sugar, tarragon and salt; bring to a boil. Reduce heat; cover and simmer for 25-30 minutes or until vegetables are tender. 3. Combine flour and milk until smooth; gradually stir into vegetable mixture. Bring to a boil; cook and stir for 2 minutes or until thickened. Add pork and heat through. Reduce heat; stir in sour cream just before serving (do not boil). I found this tip in Cook's Illustrated a while back and have been using this method ever since. 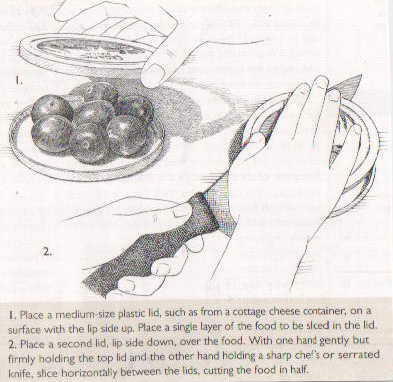 It was a great tip that allows you to NOT slice your hands. One of my favorite fruit flavors for desserts is blueberry. Kevin needed to bring a dish for a large school meeting so I thought a nice blueberry bar would do the trick. I found this recipe online and decided to try it. Typically, I use two main websites, Cooks.com and allrecipes.com. My strategy for selecting recipe is to always sort by ratings/reviews. That has generally worked very well and this time was no different. I will be using this recipe as a base recipe and try it with different fillings. This produced a very moist cake layer with a nice crumb to it. I hope you enjoy this recipe. 1. In a large mixing bowl, cream butter and sugar. Add eggs, one at a time, beating well after each addition. Beat in vanilla. 2. Combine the flour, baking powder and salt; add to creamed mixture just until combined. 3. Spread half of the batter into a greased 15-in. x 10-in. x 1-in. baking pan. Spread with pie filling; sprinkle with nutmeg. Drop remaining batter by teaspoonfuls over the top. 4. Bake at 350 degrees F for 40-45 minutes or until golden brown. 5. In a small bowl, combine the glaze ingredients until smooth. Drizzle over cooled bars. This is the second time I made these carrots and both times have really liked the end result. If you enjoy a three-bean salad or a tangy coleslaw, you will like these sweet-sour carrots. They can be served hot or cold and make a great potluck side dish. 1. Boil carrots until cooked but still firm, about 12 minutes. Drain. Combine cooked carrots with sliced pepper and onion in a bowl. 2. Combine all remaining ingredients in a saucepan. Bring to simmer over medium heat. Remove from heat and pour over carrots, onions, and peppers. Stir well. Cover and refrigerate overnight. Serve cold. I recently bought the new Taste of Home cookbook and this is the first recipe I made. We had this on Sunday this past week. The recipe does seem to have many ingredients but it really comes together and is ready quickly. The recipe calls for store-bought foccacia bread but I made mine instead since I love to make bread. I will post the bread recipe at a later date. 1. In a large skillet, cook steaks in 2 tablespoons oil over medium heat for 5-6 minutes on each side or until meat reaches desired doneness (for medium rare - 145 degrees, medium - 160 degrees, well-done 170 degrees). Remove and keep warm. 2. In the same skillet, saute the mushroms, shallot and onion in remaining oil. Add garlic and rosemary, saute 1-2 minutes longer. Stir in the red peppers, wine/broth, sugar, balsamic. Salt and pepper to taste. ; heat through. 3. Place warm foccacia on serving plates; top each with a steak and 1/2 cup mushroom mixture. Sprinkle with cheese and olives. As I was thinking about a recipe to post tonight, I realized that I had not posted many recipes of the Christmas cookies this year. For the past three years, I have had cardamom cookies on the list but they did not make the final cut. So, this was the year that it would finally happen. Cardamom spice is a highly aromatic spice which is most commonly used in Eastern, Arab, and some Scandinavian cuisines. Its unique slightly sweet and savory flavor allows it to be combined with both sweet and savory dishes. Cardamom seed's ability to enhance so many types of food is why it is combined with a wide range of other ingredients. From sea food to sauces, to meats, poultry, vegetables, and even desserts, pastries, and other baked goods. These cookies slightly resemble Snickerdoodles in flavor. They are a soft and tender cookie and definitely on my repeat list. I hope you enjoy! 1. Sift together flour, sugar, and spices; stir in peel and almonds. Cut in margarine till mixture resembles coarse crumbs. Stir in egg and milk till mixture forms a ball; chill. 3. Roll out to about 1/8-inch thickness. Cut into circles 1-3/4 inches in diameter. Place on ungreased cookie sheet; sprinkle with sugar. Bake for 6 to 8 minutes until edges are brown. Most people only eat Chicken Cordon Bleu at restaurants or those awful frozen hockey pucks in plastic bags. Actually, to make this at home is not all that difficult. Some ham, chicken cutlets, swiss cheese and breading ingredients all leave you with a very tender and juicy dinner entree. 1. Flatten chicken to 1/4-inch thickness. Top each with a slice of ham and cheese. Roll up and tuck in ends; secure with toothpicks. 2. In a shallow bowl, whisk eggs and milk. In another shallow bowl, combine cornflakes and seasonings. Dip chicken in egg mixture, then roll in crumbs. 3. Place on a greased baking sheet. Bake at 350 degrees for 40-46 minutes or until chicken juices run clear. Discard toothpicks before serving. Since I made home-made Chicken Cordon Bleu last night for dinner, I thought I would post a great tip for pounding out cutlets or chicken breasts. We all go through a lot of breakfast cereal and it seems to be a waste to throw the bag away. The great thing about these cereal bags is the fact that they are thicker and resist breakage/tearing from pounding out the chicken. I found this recipe in an old Pillsbury Casserole cookbook and decided to make it over the weekend. My sister-in-law Deb was p for the weekend and we had this for dinner on Saturday evening. Deb typically does not eat seconds but with this one she did! I think it was a big hit. This will definitely be in the permanent rotation. 1. Heat oven to 350F. Spray 13x9 inch baking dish with cooking spray. In a medium bowl, mix soup, dip and 1/3 cup onions. In a large bowl, mix chicken and buffalo wing sauce until coated. 2. Spoon 2 tablespoons soup mixture down the center of each tortilla; set remaining mixture aside. Reserve 1/2 cup cheese for garnish. Top each tortilla with about 1/4 cup chicken mixture and scant 1/4 cup cheese. Fold sides of tortillas over filling; place seam side down in baking dish. Spoon remaining soup mixture over filled tortillas. 3. Cover dish tightly with foil. Bake 40 to 45 minutes or until hot and bubbly. 4. Remove from oven. Sprinkle with reserved 1/2 cup cheese and remaining 1/3 cup onions. Bake uncovered about 5 minutes longer or until cheese is melted.